After last week’s introduction to GTD, I’ve been playing around with how to get it working really well in Zenkit. It’s a pretty simple system that relies on one master collection, some project collections, and favorites. While this system isn’t 100% perfect (what is? ), it’s as close as I can get it for now and it works pretty well! The Inbox list is where I add everything that comes to mind. I keep a Zenkit tab open at all times, so finding the list and adding to it is quick and easy. To make getting tasks from my email into Zenkit quicker, I’ve set up a Zapier Zap that sends all emails marked with a ‘GTD’ label to my ‘Inbox’ list in my Zenkit collection. This makes it super quick to triage my emails — if I see something that needs to get done, I just add the label and it automatically lands in my GTD inbox. As I process my inbox, I move things to the appropriate list so I can start working on them. Once a task has been completed, I remove the context tag (more on that later) and move it to ‘Done’. While ‘done’ is not a true GTD list, it’s a great place for me to look back on all I’ve completed over the last week. During my reviews, I archive all the items in the done list for a fresh start next week. This one’s also fairly self-explanatory. When I determine something is a Next Action, I add it to the next action list, and if possible, I add a context tag, priority label, and more info in the description if needed. When something has a distinct due date, I move it to the calendar list. 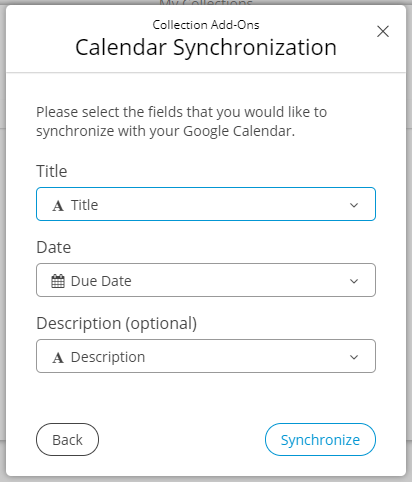 I set up two different date fields to deal with calendar entries. The first is fairly obvious, it’s the date field for tasks that are due on a certain day — i.e. the tasks that land in the ‘calendar’ list. This is the date view I choose to open my Zenkit calendar with and I have also synced this date field with my Google Calendar, so I can quickly access my tasks on the run. The second date field is used specifically for items in the ‘Waiting for…’ list that need a reminder. I set the date that the thing was added to the list, and then I set a reminder for ‘2 days later’ (or whatever time period is appropriate), to follow up with the thing I’m waiting for. Luckily for us, Zenkit is pretty awesome at project management. Whenever a new thing becomes a project, I create a new collection for it and add an item of the same name to my Projects list in the master collection. I add the link to the project collection in the project item, so I can quickly navigate to it when I need to. 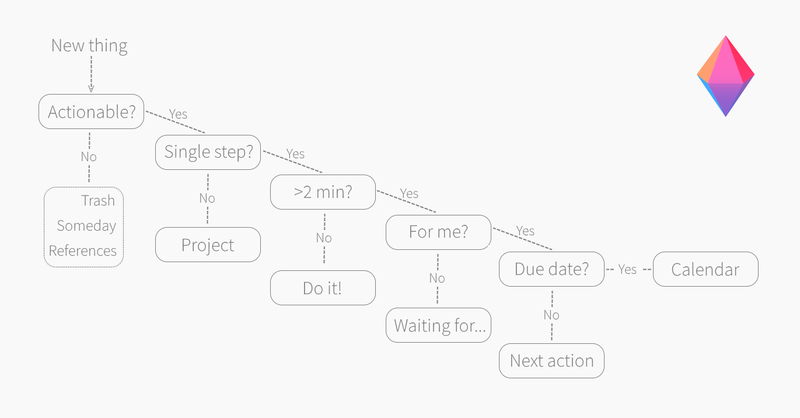 Now, when you do your reviews, you’re supposed to move a task from your project list to your Next Actions list. While you can do this using the ‘move item’ feature in Zenkit, I find it a bit tedious to move items out of my project collections and into the main collection since I’d rather see my whole project in one place. When I need to add an item to my Next Actions list, I add a context tag to it. That way, I see it alongside all the other next actions in the favorites lists. I like to keep project collections really simple. I have ‘to do’ and ‘done’ labels set up, then tag to-do’s with a context tag when they’re next up. Once a project has been completed, I archive all the items in it and delete the collection. This is one extra step to add to my review, but I find it quicker than moving each thing. This is something you can tweak to match your work style. Maybe moving items to your main collections makes sense to you, or maybe you keep projects separately like I do. My someday list is another separate collection. It’s full of things I’d like to do but that don’t belong on the Next Actions list. Lastly, I have created a separate team, imaginatively called ‘References’ where I keep different collections for things I need to reference. For me, most of these things are recipes and useful articles/research pieces I keep for work. The addition of My Favorites was a GTD game changer for me. I’d tried to use Zenkit for GTD in the past, but it was fairly unsuccessful, since using a label field then filtering for items with that label was cumbersome and un-intuitive (and annoying to do on a run to the shops!). Then we developed Favorites and a lightbulb went off. Favorites are the perfect way to manage contexts, since all the items are already in a convenient list, easy to access no matter where you are. 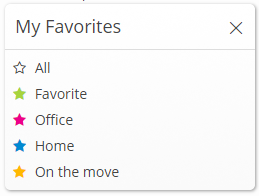 I only have a few favorites tags: office, home, and ‘on the move’. While I could add context tags for objects and people, I find that since I have my phone on me 24/7, it’s not really necessary. Additionally, although adding favorites tags for energy levels or priority would be an option, I prefer to mark them with labels, and stick to my location-based contexts with favorites tags, since they’re my most important contexts. Locations are mutually exclusive, but priority depends on location (for me at least), so I don’t see the need for a separate list there. As you can see, there is a lot of room to play around here, so you can very easily make it your own and change my system to suit your preferences better. On of the main struggles, as many users have pointed out, is getting data into Zenkit in the first place! To that effect, a direct email integration, a browser extension/web clipper functionality, and generally more and better integrations with other apps and services would really make this much easier. Additionally, an easier way to access Zenkit on the go in the form of Android and iOS apps with widgets and 3D touch support, would make life a lot easier. (iOS is already available, and Android will come very soon!) UPDATE: Android and iOS apps are both available and on par with the web app. Learn more about our Android release and iOS upgrade. Lastly, while I would love to be able to delegate tasks to other people by adding them as a member to an item in my main GTD collection, I really don’t want them to be able to see everything on my to-do list (since I mix private and work to-do’s). A way to share individual items without sharing the whole collection would solve that perfectly. I hope you enjoyed this piece! I’ve updated our GTD template to match everything I’ve described above so you can download it and start using it right away. *GTD® and Getting Things Done® are registered trademarks of The David Allen Company, and this article is not endorsed by or affiliated with them in any way. Under ‘Projects’ you say ‘I add the link to the project collection in the project item, so I can quickly navigate to it when I need to’. Do you mean you put a reference field in the item in the GTD collection that points to the project collection? Won’t that field then appear in all your GTD items? Having done that (the Reference) how do i get the tasks in the project to appear in the GTD Collection? The other thing I struggled to follow was using context tags to include tasks from a project collection in the GTD next action list, although I suspect that might become clear once I make sense of the first. Can you expand on these please? Thank you so much for your comment! I apologize for my slow response to this. 1) No, I don’t add another reference field, I just copy the URL of the project collection and add it in the description field of the project’s card. If I added a reference field for each of the projects then my collection would get a bit too cluttered. If you don’t have many projects running, it may be a good solution for you, though! Its not possible to make the tasks in the project to appear in the GTD collection without moving or copying them. Personally I keep them in their respective project collections, then use My Favorites to view my next actions. 2) Context tags are part of the ‘My Favorites’ add-on. In that example I was using ‘My Favorites’ as a next-action list, because it can show items from multiple collections in one place. I just make sure that everything in my GTD collection next actions list has a context tag, and every next action in each project also has a context tag. That way every next action appears in My Favorites. When I’m done with a next action I mark it done and remove the context tag. Hope that helped to clarify it a bit!